We are a family with varied interests so there is little limit to what we may find to offer! We're always on the lookout for great deals and unique items-check back often! If you are looking for a particular item, just let me know-I may have it or know where to find it. I will always combine shipping to the lowest price possible. Just request your total when your shopping is complete. Rosecottagedelights doesn't have any items in their booth! I have bought very nice things from this seller. My favorite is my fall leaves bracelet with the lady bugs on them. Always great prices, fast shipment and just a fun person to know. Have purchased many time for her. Always great items with great service. Top notch person. Highly recommend this seller. Well established, always personable and professional. Quality items. It is a pleasure to know this seller. 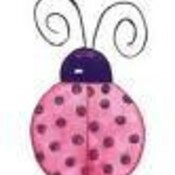 Rosecottagedelights/Ladybug is a pleasure to know! She is an honest, and experienced seller and it has been my pleasure to work with here over the past year! She always has great stuff at very reasonable prices! If you haven’t checked out RCD then you’re missing out! Be sure to try her De-lish homemade fudge! Simply THE best place to find unusual plants and this seller is wonderful! This Seller is the best. I have dealt with her for a long time and have purchased Baby clothes, Plants, jewelry an dmore. I always recieve the most Professional service. AWESOME Packaging!! Super Fast Shipping and Items always better than described..A wonderful Seller you can feel confident with. I’ve been a customer of Rosecottagedelights in a different venue and she is always friendly and professional. She is an established seller with wonderful, unique items and always provides professional service. I’ve known ladybug for the last few years at another venue and she is the best! I love her unique assortment of plants and reading what Turkish wrote about her fudge is making me absolutely drool! I have heard such things about her fudge before and plan to purchase some when I need to be thourally spoiled. Her feedback speaks volumes aboutr her chaaracter. I am so happy to recommend her to anyone here at Bonanzle. A+ Seller all the way! I bought a chocolate mint herb plant from Melissa, and was just stunned at the lovely packing and size of the plant. She sent instructions for the novice Gardner, and a little extra surprise. Buy with confidence! A wonderful asset to bonanzle! Gosh Oh Molly MY!!! This lady has the BEST Fudge. So if your thinking about it, don’t think, the faster you order the faster it will be in your mouth!I tasted 2 of her fudge flavors, mind you, I don’t usually don’t do white chocolate, BUT this white chocolate almond just melted in my mouth. The other was chocolate peanut butter…..what can I say!! Order it!! And don’t forget to get some for upcoming Valentine’s week. Awesome stuff!!! Simply the BEST! !FUDGE !! !